This fall the Office of the President and the Designing the Future(s) of the University Initiative hosted Cathy N. Davidson, Ph.D., in conversation with Georgetown University Provost Robert M. Groves on the future of higher education and her new book, The New Education: How to Revolutionize the University to Prepare Students for a World in Flux. Davidson is the Founding Director of the Futures Initiative and Distinguished Professor of English at the Graduate Center, City University of New York (CUNY), among many other roles. 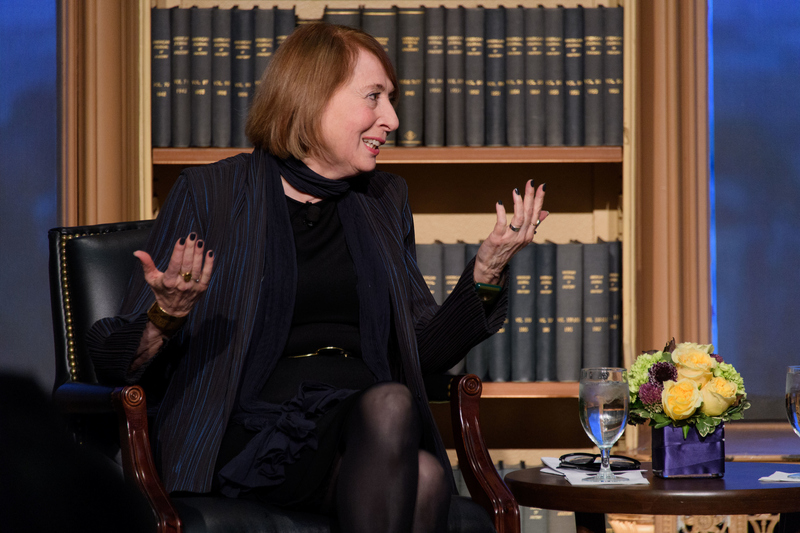 Her insights on the changing higher education landscape have sparked further conversations at Georgetown about the role of the university in addressing a complex, equitable future, and the crucial role excellent teaching plays in constructing that vision. Davidson outlined the history of higher education and highlighted the ways in which familiar higher education practices (grading scales, academic departments, and the distribution of credits, just to name a few) remain largely reflective of the Industrial Revolution. And yet, she noted, the world underwent tremendous change with the emergence of the Digital Age and the invention of the internet in the late 20th century; new technologies have redefined and complexified the ways we relate to each other, to ideas, and the world. In her talk and recent book, Davidson suggests higher education institutions must now respond to these massive changes in order to prepare students for our interconnected world and the future of it. Alongside this discussion of teaching to this “world in flux,” Davidson spoke about the roles universities must play in contributing to greater access and social mobility. Groves further examines this subject following the event in his blog post, “Taking Charge of Change.” Groves suggests that as we continue to value those best practices in higher education that endure across time, “we might [also] focus more consistent attention on how we can do our institution’s part at building a better, more equitable world.” His message, much like Davidson’s, is future-looking, rooted in a framework of best practices, equity, and care for students. While addressing the current university culture and striving towards a more equitable world may seem daunting tasks, “[h]ow we teach,” Groves writes in his post, “is part of that solution.” Davidson and Groves suggest that good teaching practices in tandem with collaborative technologies can transform the university into the place it needs to be, both now and in the future. Davidson shared her experiences reimagining an early massive open online course (MOOC) she taught as an interactive, global seminar as an example of technology’s strength—what she called “the human affordance of having global context in a very personal way.” Davidson also led the audience in an analog active learning exercise that engaged all audience members: she distributed notecards and asked the audience to list three things they would change were they to become “King of Georgetown” tomorrow. (The Future(s) Initiative collected the cards, and posted a few samples in their blog on the event.) These examples show that massive, institution-wide change can start at the individual level of teaching. This approach to excellent teaching through best practices and collaborative technologies is one we hold close at CNDLS. It informs our focus on Scholarship of Teaching and Learning (SoTL) research and best practices in teaching and learning, our commitment to faculty support, and our work on the [cutting edge] of technology-enhanced learning and online programs. As the new year and semester begin, we look forward to continuing this work and offering support to the Georgetown community. Are you a faculty member looking for pedagogy or technology resources in the new semester? You can head to our Teaching Commons, check out our Mid-Semester Teaching Feedback sessions, or schedule a consultation for in-person feedback on your teaching. Our Inclusive Pedagogy page features resources and programs to support equity and inclusion in the classroom. Check out our Technology Enhanced Learning and Online Programs work for ideas on how to best create an interconnected, digitally-fluent classroom space. Or, stop by our offices in Car Barn 314 anytime to speak with a member of the CNDLS team. You can watch Davidson and Groves’ full conversation here. Davidson’s new book, The New Education: How to Revolutionize the University to Prepare Students for a World in Flux, is currently in print. This fall the Office of the President and the Designing the Future(s) of the University Initiative hosted Cathy N. Davidson, Ph.D., in conversation with Georgetown University Provost Robert M. Groves on the future of higher education and her new book, The New Education: How to Revolutionize the University to Prepare Students for a World in Flux. Davidson is the Founding Director of the Futures Initiative and Distinguished Professor of English at the Graduate Center, City University of New York (CUNY), among many other roles. 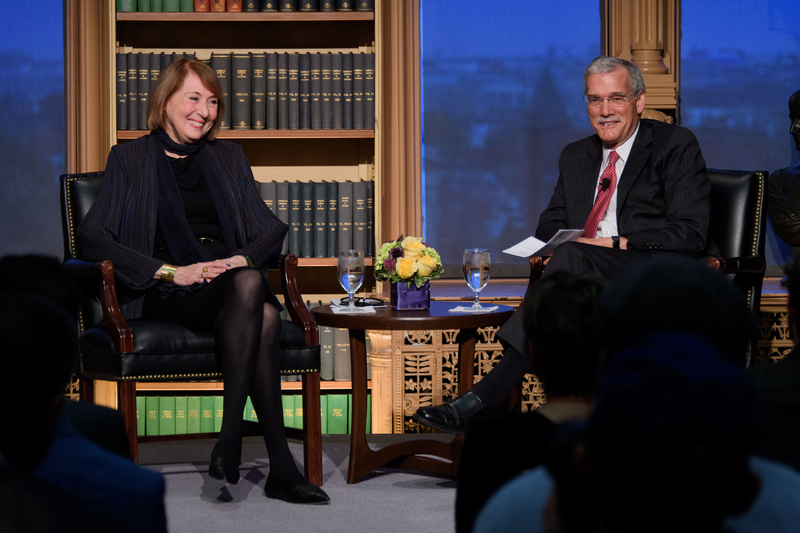 Her insights on the changing higher education landscape have sparked further conversations at Georgetown about the role of the university in addressing a complex, equitable future, and the crucial role excellent teaching plays in constructing that vision. Davidson outlined the history of higher education and highlighted the ways in which familiar higher education practices (grading scales, academic departments, and the distribution of credits, just to name a few) remain largely reflective of the Industrial Revolution. And yet, she noted, the world underwent tremendous change with the emergence of the Digital Age and the invention of the internet in the late 20th century; new technologies have redefined and complexified the ways we relate to each other, to ideas, and the world. In her talk and recent book, Davidson suggests higher education institutions must now respond to these massive changes in order to prepare students for our interconnected world and the future of it. Alongside this discussion of teaching to this “world in flux,” Davidson spoke about the roles universities must play in contributing to greater access and social mobility. Groves further examines this subject following the event in his blog post, “Taking Charge of Change.” Groves suggests that as we continue to value those best practices in higher education that endure across time, “we might [also] focus more consistent attention on how we can do our institution’s part at building a better, more equitable world.” His message, much like Davidson’s, is future-looking, rooted in a framework of best practices, equity, and care for students. While addressing the current university culture and striving towards a more equitable world may seem daunting tasks, “[h]ow we teach,” Groves writes in his post, “is part of that solution.” Davidson and Groves suggest that good teaching practices in tandem with collaborative technologies can transform the university into the place it needs to be, both now and in the future. Davidson shared her experiences reimagining an early massive open online course (MOOC) she taught as an interactive, global seminar as an example of technology’s strength—what she called “the human affordance of having global context in a very personal way.” Davidson also led the audience in an analog active learning exercise that engaged all audience members: she distributed notecards and asked the audience to list three things they would change were they to become “King of Georgetown” tomorrow. (The Future(s) Initiative collected the cards, and posted a few samples in their blog on the event.) These examples show that massive, institution-wide change can start at the individual level of teaching. This approach to excellent teaching through best practices and collaborative technologies is one we hold close at CNDLS. It informs our focus on Scholarship of Teaching and Learning (SoTL) research and best practices in teaching and learning, our commitment to faculty support, and our work on the [cutting edge] of technology-enhanced learning and online programs. As the new year and semester begin, we look forward to continuing this work and offering support to the Georgetown community. Are you a faculty member looking for pedagogy or technology resources in the new semester? You can head to our Teaching Commons, check out our Mid-Semester Teaching Feedback sessions, or schedule a consultation for in-person feedback on your teaching. Our Inclusive Pedagogy page features resources and programs to support equity and inclusion in the classroom. Check out our Technology Enhanced Learning and Online Programs work for ideas on how to best create an interconnected, digitally-fluent classroom space. Or, stop by our offices in Car Barn 314 anytime to speak with a member of the CNDLS team. You can watch Davidson and Groves’ full conversation here. Davidson’s new book, The New Education: How to Revolutionize the University to Prepare Students for a World in Flux, is currently in print. Posted February 1, 2018 by Erika Bullock & filed under events. If you missed the 2017 Teaching, Learning and Innovation Summer Institute (TLISI) or would like to revisit a TLISI topic, follow along with us as as we feature various sessions on the Prospect blog over the course of the 2017-18 academic year. We’ll be sharing posts on the following themes: Teaching in the Jesuit Tradition, Incorporating Difficult and Timely Topics, Innovative Teaching Practices, Technology Enhanced Learning, Evidence-based Teaching and Learning, Inclusive Pedagogies, and Cross-Institutional & Cross-Departmental Collaborations. Many of the sessions were recorded and are viewable on Digital Georgetown (accessible by anyone with a Georgetown NetID). You can also find a links to all of our recorded sessions on the TLISI Resources page. Please follow us on Twitter and Facebook and sign up for our newsletter to stay updated on posts and more! With more than one in four students taking at least one distance education course (2015 Survey of Online Learning) and the number increasing each year, it is no surprise that Georgetown has been paying close attention to this population of online learners. At CNDLS, we are proud to offer support in online course design and development. We have several instructional designers who are available to support any faculty member interested in learning more about online course or program design and development, and have also designed and developed several Massive Open Online Courses (MOOCs). Additionally, leaders at Georgetown’s School of Continuing Studies (SCS) also have begun to offer degree programs in the online space. 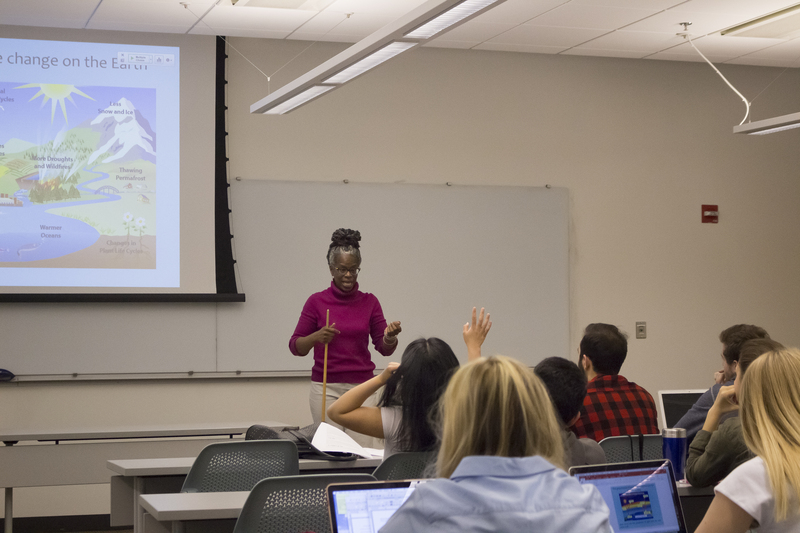 In a panel session on May 25, 2017 titled “Innovatively Using Technology to Enhance Online Learning, Face-to-Face Teaching, and to Infuse Georgetown Values Throughout the Curriculum,” Shenita Ray, Director of SCS’s Online Operations, and five SCS Faculty Directors discussed the benefits and challenges of offering online courses. Sharing their thoughts were Daniel Kelly (Sports Industry Management), Cylor Spaulding (Public Relations and Corporate Communications), Maria Trujillo (Systems Engineering and Technology Management), Glenn Williamson (Real Estate), and Wendy Zajack (Integrated Marketing Communications). The panel covered topics from the design and development of online courses to increasing teacher/student interaction in the online space. They also discussed how the deeply rooted Jesuit values of Georgetown University are incorporated in this space and shared personal experience about their roles as faculty directors and associate professors. Those who make the transition from the classroom to the online space often wonder how they will remain engaged with students in the class. Panelists shared that all online courses at SCS include synchronous sessions at various points throughout the semester to allow instructors and students to meet each other and check-in about assignments. One example of how this has been implemented in a primarily online course is through the Sports Industry Management capstone course. In the capstone, students have a semester-long project and have instructor check-ins via synchronous sessions so that students can receive meaningful feedback to produce a better final project. The panel members all voiced that they hope to implement the synchronous sessions practice into their face-to-face courses as well. One challenge often expressed by online course instructors is the amount of time required of instructors. Williamson noted that giving students feedback in the online space is more time consuming because instructors are responding to each individual student about their specific thoughts. However, panelists noted that the lack of commute to the classroom and ability to respond at times best suited for them makes responding to individual students manageable. Not only do online classes change the way professors interact with their students, but, according to the panelists’ experiences, online courses change the way in which students interact with their professors. Zajack shared her observation that the online space “levels the playing field” in a way, because all students are required to respond in discussions and instructors are able to hear more from those who may have been more introverted in a face-to-face course. For SCS instructors, it was important to keep in mind Georgetown’s Jesuit identity when conceptualizing online courses, and to incorporate the Jesuit values into the curriculum. 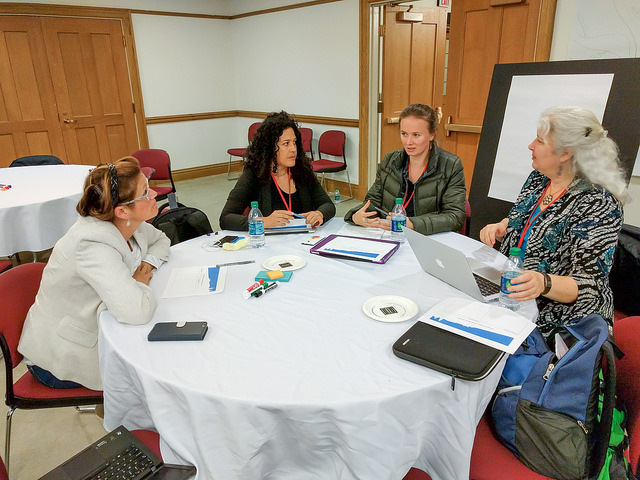 Ray collaborated with Mary Novak (Associate Director for Ignatian Formation) to design a Jesuit-influenced framework and guidelines for Instructional Designers and instructors who are designing online courses to use in their design and development process to help reflect the Jesuit values. Panelists shared their experiences integrating these values into their online course design. The Integrated Marketing Communications program works to address cura personalis in their courses by meeting the individual needs of their students by offering more opportunities to get connected on campus and feel part of the larger Georgetown community. Ray believes there is more work to be done here, as instructors become more comfortable with online teaching and begin to really think about how Jesuit values can be incorporated into the online course environment. The Faculty Directors echoed that in order to address the needs of all students, the development and revision of online courses is an ongoing and ever-changing. Just as in a face-to-face course, an instructor must continue to revise and improve their teaching each semester. This is an exciting time for instructors and learners at the School of Continuing Studies, as online courses provide a broader learning opportunity for students and instructors are able to reach more students. To learn more about SCS and the Summer 2018 online course offerings, visit their website. 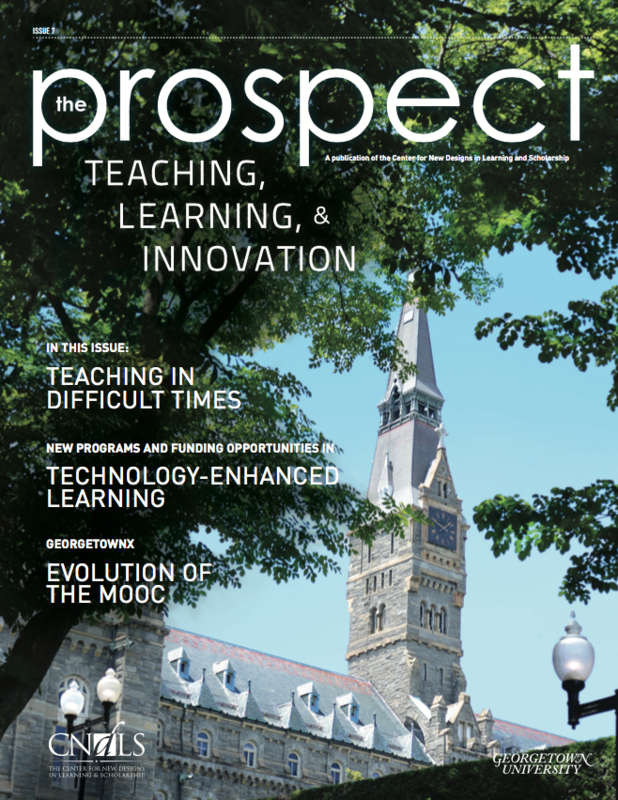 If you missed the 2017 Teaching, Learning and Innovation Summer Institute (TLISI) or would like to revisit a TLISI topic, follow along with us as as we feature various sessions on the Prospect blog over the course of the 2017-18 academic year. We’ll be sharing posts on the following themes: Teaching in the Jesuit Tradition, Incorporating Difficult and Timely Topics, Innovative Teaching Practices, Technology Enhanced Learning, Evidence-based Teaching and Learning, Inclusive Pedagogies, and Cross-Institutional & Cross-Departmental Collaborations. Many of the sessions were recorded and are viewable on Digital Georgetown (accessible by anyone with a Georgetown NetID). You can also find a links to all of our recorded sessions on the TLISI Resources page. Please follow us on Twitter and Facebook and sign up for our newsletter to stay updated on posts and more! 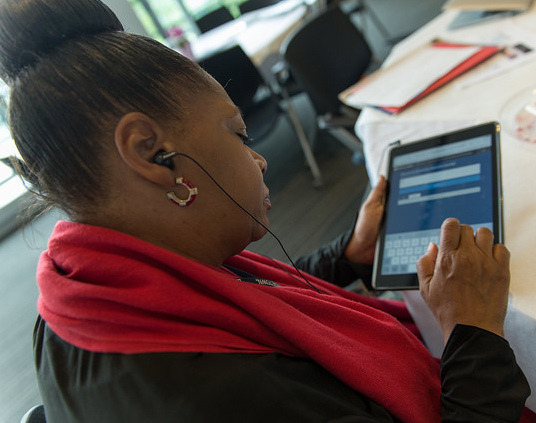 With more than one in four students taking at least one distance education course (2015 Survey of Online Learning) and the number increasing each year, it is no surprise that Georgetown has been paying close attention to this population of online learners. At CNDLS, we are proud to offer support in online course design and development. We have several instructional designers who are available to support any faculty member interested in learning more about online course or program design and development, and have also designed and developed several Massive Open Online Courses (MOOCs). Additionally, leaders at Georgetown’s School of Continuing Studies (SCS) also have begun to offer degree programs in the online space. In a panel session on May 25, 2017 titled “Innovatively Using Technology to Enhance Online Learning, Face-to-Face Teaching, and to Infuse Georgetown Values Throughout the Curriculum,” Shenita Ray, Director of SCS’s Online Operations, and five SCS Faculty Directors discussed the benefits and challenges of offering online courses. Sharing their thoughts were Daniel Kelly (Sports Industry Management), Cylor Spaulding (Public Relations and Corporate Communications), Maria Trujillo (Systems Engineering and Technology Management), Glenn Williamson (Real Estate), and Wendy Zajack (Integrated Marketing Communications). The panel covered topics from the design and development of online courses to increasing teacher/student interaction in the online space. They also discussed how the deeply rooted Jesuit values of Georgetown University are incorporated in this space and shared personal experience about their roles as faculty directors and associate professors. Those who make the transition from the classroom to the online space often wonder how they will remain engaged with students in the class. Panelists shared that all online courses at SCS include synchronous sessions at various points throughout the semester to allow instructors and students to meet each other and check-in about assignments. One example of how this has been implemented in a primarily online course is through the Sports Industry Management capstone course. In the capstone, students have a semester-long project and have instructor check-ins via synchronous sessions so that students can receive meaningful feedback to produce a better final project. The panel members all voiced that they hope to implement the synchronous sessions practice into their face-to-face courses as well. One challenge often expressed by online course instructors is the amount of time required of instructors. Williamson noted that giving students feedback in the online space is more time consuming because instructors are responding to each individual student about their specific thoughts. However, panelists noted that the lack of commute to the classroom and ability to respond at times best suited for them makes responding to individual students manageable. Not only do online classes change the way professors interact with their students, but, according to the panelists’ experiences, online courses change the way in which students interact with their professors. Zajack shared her observation that the online space “levels the playing field” in a way, because all students are required to respond in discussions and instructors are able to hear more from those who may have been more introverted in a face-to-face course. For SCS instructors, it was important to keep in mind Georgetown’s Jesuit identity when conceptualizing online courses, and to incorporate the Jesuit values into the curriculum. Ray collaborated with Mary Novak (Associate Director for Ignatian Formation) to design a Jesuit-influenced framework and guidelines for Instructional Designers and instructors who are designing online courses to use in their design and development process to help reflect the Jesuit values. Panelists shared their experiences integrating these values into their online course design. The Integrated Marketing Communications program works to address cura personalis in their courses by meeting the individual needs of their students by offering more opportunities to get connected on campus and feel part of the larger Georgetown community. Ray believes there is more work to be done here, as instructors become more comfortable with online teaching and begin to really think about how Jesuit values can be incorporated into the online course environment. The Faculty Directors echoed that in order to address the needs of all students, the development and revision of online courses is an ongoing and ever-changing. Just as in a face-to-face course, an instructor must continue to revise and improve their teaching each semester. This is an exciting time for instructors and learners at the School of Continuing Studies, as online courses provide a broader learning opportunity for students and instructors are able to reach more students. To learn more about SCS and the Summer 2018 online course offerings, visit their website. Posted January 30, 2018 by Kylie McGraw & filed under TLISI. CNDLS is pleased to announce the 2018 CNDLS TEL Colloquium cohort. The theme of this year’s Colloquium is Designing for Context: Approaches to Blended Learning. Fourteen faculty from 10 departments and five different schools (College, Graduate School of Arts and Sciences, McDonough School of Business, School of Continuing Studies, and School of Medicine) will join the cohort. The Colloquium participants will begin meeting at the end of January to explore topics in technology-enhanced learning (TEL) while designing and implementing an individual TEL project. Congratulations to this impressive group of faculty! Posted January 25, 2018 by Katherine Grygo & filed under TEL. For the most part, teachers at colleges and universities work in parallel, engaged with their students but not necessarily with one another. And yet, as we keep discovering at CNDLS, amazing things happen when you create spaces where faculty can come together to grow. We see this again and again in our work in the Engelhard Project; this project was launched in 2005 with a student focus, aiming to infuse issues of student well-being throughout the curriculum at Georgetown University, but it’s also had the effect of fostering connections among faculty and staff along the way. This year we received a gift to enable us to extend the impact of the Engelhard Project in a number of ways. Among those expansions, in fall 2017 we launched a vibrant new Faculty Conversation Series that creates opportunities for faculty to deeply engage with each other around their teaching. For the first conversation theme for fall 2017, we partnered with Georgetown’s Office of Mission and Ministry to pilot a Teaching to Mission faculty conversation series. This first semester, the series focused on what it means to teach at Georgetown, and the ways in which Georgetown’s Jesuit values and mission motivate and energize our work, making their way into our classrooms and affecting our relationships with students and colleagues. 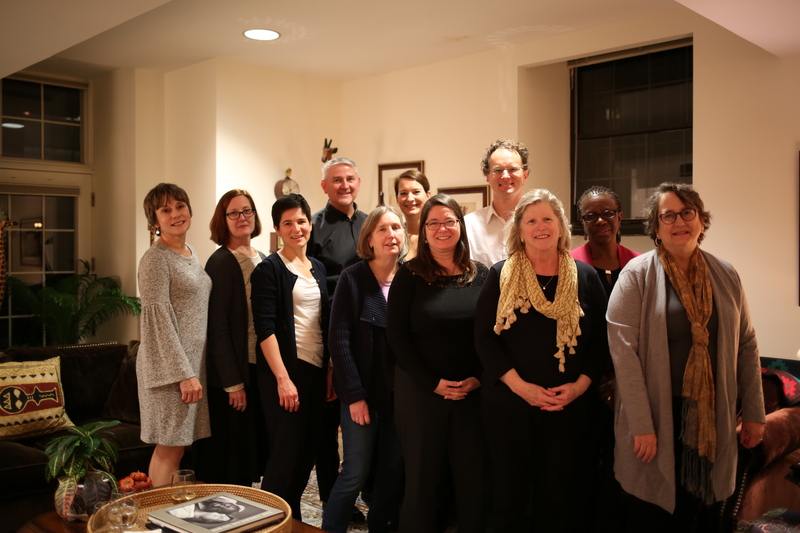 Eight professors gathered with four facilitators for informal dinners to discuss James Martin’s book The Jesuit Guide to Almost Everything as well as a few supplemental readings, all selected to draw out connections between participants’ teaching and Ignatian values and practices. The value of these conversations quickly became self-evident. As Diana Owen (Communication, Culture, and Technology) reflected, “It was affirming to hear others speak about the power of the Spiritual Exercises”—a formal Jesuit process of self-exploration and contemplation—“to influence their lives, and especially their approach to teaching….The discussion has me thinking of ways of reawakening the virtues of the Exercises in my teaching.” As the semester went on, these conversations ranged beyond teaching practices and engaging with students to participants thinking more broadly and holistically about themselves and their relationship to our Catholic and Jesuit university. Biology professor Anne Rosenwald noted that the “conversations were open, frank, and loving, so I felt very supported to say things that don’t normally get revealed in an academic, professional setting.” And community developed in the room itself. In the words of Sociology professor Sarah Stiles, “What a joy to look around the table and see so many spirited conversations among interesting colleagues!” Going forward, we’ll be launching more such spirited conversations. In addition to teaching to mission, we hope to bring groups together around other new topics, such as mentorship and inclusive pedagogy. The Engelhard Project will continue to build connections and foster community not only among students but among their teachers, too. For the most part, teachers at colleges and universities work in parallel, engaged with their students but not necessarily with one another. And yet, as we keep discovering at CNDLS, amazing things happen when you create spaces where faculty can come together to grow. We see this again and again in our work in the Engelhard Project; this project was launched in 2005 with a student focus, aiming to infuse issues of student well-being throughout the curriculum at Georgetown University, but it’s also had the effect of fostering connections among faculty and staff along the way. This year we received a gift to enable us to extend the impact of the Engelhard Project in a number of ways. Among those expansions, in fall 2017 we launched a vibrant new Faculty Conversation Series that creates opportunities for faculty to deeply engage with each other around their teaching. For the first conversation theme for fall 2017, we partnered with Georgetown’s Office of Mission and Ministry to pilot a Teaching to Mission faculty conversation series. This first semester, the series focused on what it means to teach at Georgetown, and the ways in which Georgetown’s Jesuit values and mission motivate and energize our work, making their way into our classrooms and affecting our relationships with students and colleagues. Eight professors gathered with four facilitators for informal dinners to discuss James Martin’s book The Jesuit Guide to Almost Everything as well as a few supplemental readings, all selected to draw out connections between participants’ teaching and Ignatian values and practices. Going forward, we’ll be launching more such spirited conversations. In addition to teaching to mission, we hope to bring groups together around other new topics, such as mentorship and inclusive pedagogy. The Engelhard Project will continue to build connections and foster community not only among students but among their teachers, too. Posted January 23, 2018 by David Ebenbach & filed under engelhard. If you missed the 2017 Teaching, Learning and Innovation Summer Institute (TLISI) or would like to revisit a TLISI topic, follow along with us as as we feature various sessions on the Prospect blog over the course of the 2017-18 academic year. We’ll be sharing posts on the following themes: Teaching in the Jesuit Tradition, Incorporating Difficult and Timely Topics, Innovative Teaching Practices, Technology Enhanced Learning, Evidence-based Teaching and Learning, Inclusive Pedagogies, and Cross-Institutional & Cross-Departmental Collaborations. Many of the sessions were recorded and are viewable on Digital Georgetown (accessible by anyone with a Georgetown NetID). You can also find a links to all of our recorded sessions on the TLISI Resources page. Please follow us on Twitter and Facebook and sign up for our newsletter to stay updated on posts and more! How can you incorporate podcasts into your classroom, and why should you? In the TLISI “Live from the Classroom” session on May, 23, 2017, Nikoo Yahyazadeh, a Multimedia Specialist at Georgetown University’s Gelardin New Media Center, discussed how teachers might begin to think about incorporating podcasts into their classrooms. One important take-away she stressed was the concept that professors should not feel limited by their own technical proficiencies when it comes to incorporating technology into the classroom. The Gelardin New Media Center can help faculty implement podcasts assignments and guide their students through the technical processes of creating podcasts Yahyazadeh encouraged those who are thinking about creating podcasts to think critically about the media and why they want to work in that form, and also encouraged educators to consider the amount of planning time necessary for classroom integration. A podcast assignment can be time consuming for students and can take just as much effort to grade as a traditional essay. Implementing a podcast in one course may not be as successful or effective as implementing it every semester again and again and improving the process. Faculty who are interested in implementing podcasts into their courses can follow the below helpful steps, and can reach out to Gelardin for additional support. The first step is inspiration, which can also be the most stressful step. A good podcast for a classroom is one that connects to the learning goals and helps the class to understand the content of the course in a deeper and more engaging way, rather than just having the assignment be the equivalent of an audio book report. It is also important to consider the structure of the podcast and narrative presented. An effective podcast builds upon itself every week not only requires a coherent narrative, but also demands the engagement of the listener from beginning to end. A more traditional radio show , however, allows for a listener to drop in and out of different episodes. The second step is preparation. To develop the assignment, it is necessary for professors to develop a rubric for what they would like to see reflected in the final projects, and to consider such things as whether the students are allowed to use copyrighted material or whether they should work independently or with partners. A breakdown of deadlines is also helpful in keeping students stay on track (such as a timeline for a finalized script, interviews, and edits to the podcast) , and it is often helpful to incorporate time for peer feedback. The last stage of launching a podcast is implementation. This is the exciting, hands-on part of the process, and the stage where it might be helpful to have students come into Gelardin for the initial equipment and software training and to learn about the process of using mics, set-ups, and programs like GarageBand. Gelardin can also offer follow-up lab time and follow-up one-on-one consultations. No matter what form the final podcast may take, however, as a platform for scholarship and creating a dissemination of knowledge outside of academic formats, many professors at Georgetown have found podcasts useful in expanding the impact of a course outside of the classroom and helping their students to engage more fully with the course material. Adam Rothman (History) spoke about his experience in implementing a podcast assignment in his undergraduate course, American Studies 272: Facing Georgetown’s History. Rothman explained that this class came out of a pre-existing curriculum in the American Studies department focusing on Georgetown’s history of slavery and spoke on the importance of the podcast to the learning goals of the course, which was socially engaged and aimed to produce knowledge that would benefit the public. He explained how he wanted students to produce knowledge that would actively advance the goals of Georgetown’s Working Group on Slavery, Memory, and Reconciliation. He thought that the potential of the podcast to become public would encourage students to take their projects more seriously and commit more fully - as the stakes were raised and the students knew that people other than their professor might end up listening. Rothman played clips of the various projects students had chosen, which included interviewing descendants, discussing the privileging of acceptance for descendants of slaves, an exploration of the history of families who had sued for their freedom in the 19th century, and another podcast based around a photograph. Marcia Chatelain (History) discussed a podcast she created called “Office Hours: The Podcast,” which she developed after realizing there was a critical mass of students whose personal lives and individual struggles went virtually unknown by their professors. In this she saw a divide between access and quality of experience of students in universities, and hoped that a podcast could shed light on these students and help to form a model for other professors of ways to engage their students and get to know them while still maintaining professional boundaries. On her podcast, Chatelain interviews one student a week around a general theme. She played a variety of clips from her show and then spoke about h the specific ways she approached recording difficult conversations with students, such as making sure they felt comfortable with the process by having them review the final edit before it was made public, and asking students to wait and think about it for a week before releasing the podcasts online. She also noted that most students are very familiar with the notion of how things on the internet will last forever, and that many have already experienced things like trolling and cyberbullying and know what they are getting into. With that said, many of the students revealed very personal things on her podcast and so she remained constant and vigilant about students’ comfort. She often asked: have you spoken about these personal matters publicly before? Chatelain emphasized that the point of this podcast was to be a conversation between the student and the community, not an exposé. Of course, despite their unique benefits, podcasts also pose challenges for faculty in terms of determining how to grade these nontraditional assignments and measure their outcomes. Panelists mentioned that it is possible to grade students holistically based on how dedicated they are to the podcast, independent of the quality of editing or even of writing (since many conversations on podcasts are extemporaneous), but that a more exact rubric, evaluating the podcast specifically for certain goals in terms of content, analysis, and editing (whether the podcast incorporated sound effects, for example), could also be used. Other complicating factors of Podcast use that should be taken into consideration are students’ comfort with hearing their own voices, the possibility of a podcast to extend to a wider audience, who might be listening outside of the understood context of the class, and the appropriateness of the monetization of podcasts and use of ads. However, despite the technical, conceptual, and ideological considerations and imaginings that often accompany the creation of a podcast, all panelists agreed that the conversations they have inspired in their courses and for their students have been meaningful. How can you incorporate podcasts into your classroom, and why should you? 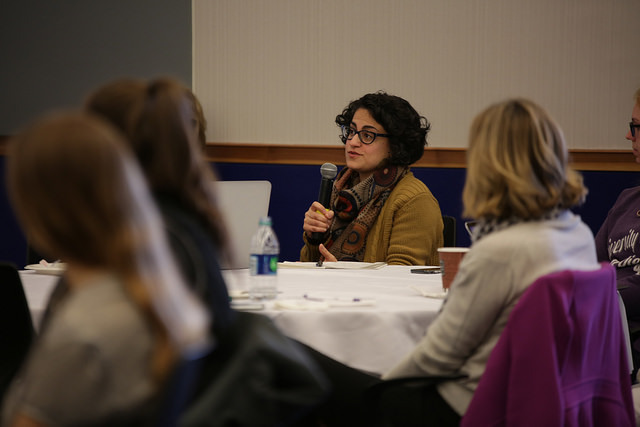 Yahyazadeh encouraged those who are thinking about creating podcasts to think critically about the media and why they want to work in that form, and also encouraged educators to consider the amount of planning time necessary for classroom integration. A podcast assignment can be time consuming for students and can take just as much effort to grade as a traditional essay. Implementing a podcast in one course may not be as successful or effective as implementing it every semester again and again and improving the process. Faculty who are interested in implementing podcasts into their courses can follow the below helpful steps, and can reach out to Gelardin for additional support. The first step is inspiration, which can also be the most stressful step. A good podcast for a classroom is one that connects to the learning goals and helps the class to understand the content of the course in a deeper and more engaging way, rather than just having the assignment be the equivalent of an audio book report. It is also important to consider the structure of the podcast and narrative presented. An effective podcast builds upon itself every week not only requires a coherent narrative, but also demands the engagement of the listener from beginning to end. A more traditional radio show , however, allows for a listener to drop in and out of different episodes. The second step is preparation. To develop the assignment, it is necessary for professors to develop a rubric for what they would like to see reflected in the final projects, and to consider such things as whether the students are allowed to use copyrighted material or whether they should work independently or with partners. A breakdown of deadlines is also helpful in keeping students stay on track (such as a timeline for a finalized script, interviews, and edits to the podcast) , and it is often helpful to incorporate time for peer feedback. The last stage of launching a podcast is implementation. This is the exciting, hands-on part of the process, and the stage where it might be helpful to have students come into Gelardin for the initial equipment and software training and to learn about the process of using mics, set-ups, and programs like GarageBand. Gelardin can also offer follow-up lab time and follow-up one-on-one consultations. No matter what form the final podcast may take, however, as a platform for scholarship and creating a dissemination of knowledge outside of academic formats, many professors at Georgetown have found podcasts useful in expanding the impact of a course outside of the classroom and helping their students to engage more fully with the course material. Adam Rothman (History) spoke about his experience in implementing a podcast assignment in his undergraduate course, American Studies 272: Facing Georgetown’s History. Rothman explained that this class came out of a pre-existing curriculum in the American Studies department focusing on Georgetown’s history of slavery and spoke on the importance of the podcast to the learning goals of the course, which was socially engaged and aimed to produce knowledge that would benefit the public. He explained how he wanted students to produce knowledge that would actively advance the goals of Georgetown’s Working Group on Slavery, Memory, and Reconciliation. He thought that the potential of the podcast to become public would encourage students to take their projects more seriously and commit more fully – as the stakes were raised and the students knew that people other than their professor might end up listening. Rothman played clips of the various projects students had chosen, which included interviewing descendants, discussing the privileging of acceptance for descendants of slaves, an exploration of the history of families who had sued for their freedom in the 19th century, and another podcast based around a photograph. Marcia Chatelain (History) discussed a podcast she created called “Office Hours: The Podcast,” which she developed after realizing there was a critical mass of students whose personal lives and individual struggles went virtually unknown by their professors. In this she saw a divide between access and quality of experience of students in universities, and hoped that a podcast could shed light on these students and help to form a model for other professors of ways to engage their students and get to know them while still maintaining professional boundaries. On her podcast, Chatelain interviews one student a week around a general theme. She played a variety of clips from her show and then spoke about h the specific ways she approached recording difficult conversations with students, such as making sure they felt comfortable with the process by having them review the final edit before it was made public, and asking students to wait and think about it for a week before releasing the podcasts online. She also noted that most students are very familiar with the notion of how things on the internet will last forever, and that many have already experienced things like trolling and cyberbullying and know what they are getting into. With that said, many of the students revealed very personal things on her podcast and so she remained constant and vigilant about students’ comfort. She often asked: have you spoken about these personal matters publicly before? Chatelain emphasized that the point of this podcast was to be a conversation between the student and the community, not an exposé. Of course, despite their unique benefits, podcasts also pose challenges for faculty in terms of determining how to grade these nontraditional assignments and measure their outcomes. Panelists mentioned that it is possible to grade students holistically based on how dedicated they are to the podcast, independent of the quality of editing or even of writing (since many conversations on podcasts are extemporaneous), but that a more exact rubric, evaluating the podcast specifically for certain goals in terms of content, analysis, and editing (whether the podcast incorporated sound effects, for example), could also be used. Other complicating factors of Podcast use that should be taken into consideration are students’ comfort with hearing their own voices, the possibility of a podcast to extend to a wider audience, who might be listening outside of the understood context of the class, and the appropriateness of the monetization of podcasts and use of ads. However, despite the technical, conceptual, and ideological considerations and imaginings that often accompany the creation of a podcast, all panelists agreed that the conversations they have inspired in their courses and for their students have been meaningful. Posted January 16, 2018 by Sasha Patkin & filed under TLISI. 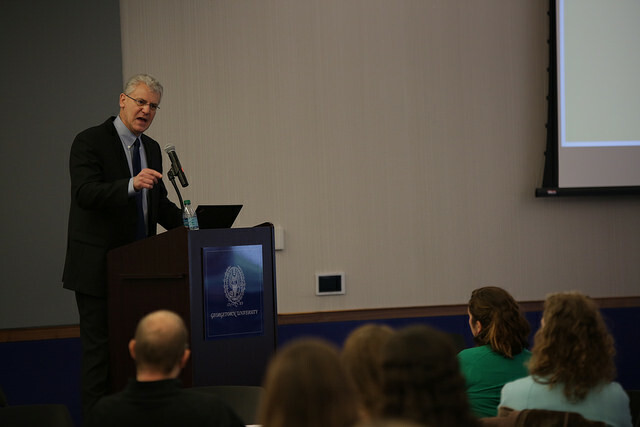 On December 14, 2017, W. Brad Johnson, Ph.D., a professor of psychology in the Department of Leadership, Ethics, and Law at the United States Naval Academy and author of On Being a Mentor: A Guide for Higher Education Faculty and Athena Rising: How and Why Men Should Mentor Women, came to Georgetown to discuss the landscape around mentoring in academic environments. Johnson began by noting that mentoring often gets presented as a panacea. He noted that despite the fact that there is able research to support that undergraduates with mentors perform better both academically and professionally, and report feeling more confident, competent, more comfortable with their work-life balance, and achieve more imminent things in their professions, simply setting up an administrative “mentoring” program is not enough to achieve these results. Rather, Johnson emphasized that mentoring is a time-intensive activity, and only about 25% of undergraduate students reported that they felt as though they had a mentor - or even a professor who cared about them - during their entire college career. What is a mentor, and how do these relationships take off? Johnson prompted those at the tables around the room to discuss a scenario: Imagine two students come to your door and ask if you can be their mentor. How do you respond? How do you select the people to work with? Would you respond to these students in the same way? What is the best strategy for navigating this situation? The situation sparked a number of conversations as many participants realized that they did have preferences for the kind of students they prefer to mentor. Continuing, Johnson explained that different methods of matching students to mentors come with their own unique pros and cons. In an institution that has a formal program to match people with mentors (as opposed to having students find their mentors organically), more students tend to find a mentor. In these formal relationships, there are clear goals and endpoints for the relationship, defined boundaries, and informed consent between the parties. Allowing relationship to form naturally can lead to stronger partnerships and fonder feelings—however, sometimes at the cost of a clear definition of the relationship. He noted that in these kinds of relationships mentors may not even be aware that their mentees regard them as mentors until they hear about the impact they had on that student years after their graduation. On a similar note, Johnson also cautioned the room against labelling themselves as a “mentor” in these more natural relationships, and instead encouraged participants to wait for their students to assign them this title. After all, he noted, mentorship is a continuum. Many mentorships begin as more formal relationships—such as that of a research supervisor or an advisor—but as trust develops, a mentorship becomes more reciprocal. How can you become a mentor, and who should you mentor? Johnson noted that research indicates that spending time listening to your mentees is a top element of developing a successful relationship, and that carefully considering how you arrange your meetings is crucial to making students comfortable. For example, do you meet in your office, in a coffee shop, or in a bar? Do you meet at a time that is convenient for people with families, or in a place that alienates a certain type of student? He encourages faculty to consider the students that they already mentor, and ask themselves who might be missing. Do they mentor exclusively men? Exclusively people who mirror themselves? What makes for a truly meaningful mentorship? Johnson also spoke about other important elements of being a good mentor, such as encouraging mentees. He noted that imposter syndrome is prevalent among students, so telling your students that they belong and practicing affirmation in your comments is an important part of being a mentor. Especially when mentoring undergraduates, Johnson emphasized the importance of being conscious of these students’ ongoing developmental psychology and student development - recognizing and having sensitivity to the fact that they are in a stage of emerging adulthood. Rather than pressuring decisions, a good mentor unearths “the dream” - a vision of what an ideal world would look like. A good mentor practices the “Michelangelo phenomenon”—a term in psychology to describe how the best partners work with each other. How do you draw out the best in your partner? Mentors have to approach their mentees with the same humility and unassuming nature as Michelangelo took to the block - he was surprised when Moses or David would emerge, claiming that he didn’t always know what he was going to create. Ask your students Socratic questions in moments of crisis - asking them what they think a solution to a problem might be or what they would like to do, rather than telling them or handing them advice. Being unconditionally, non-judgmentally supportive and approaching relationships with humility and a learning disposition is essential, as is validating a student’s own style, rather than cloning oneself. Although mentors are not therapists, it’s also important to recognize that some students students come with unresolved issues - either rockstar students with a lack of confidence, perfectionist mentees with fears of failure, or students who approach the mentoring relationship as in some way reparative for another, more fraught relationship. Again, Johnson emphasized the importance of affirmation in these relationships. Be a champion for your students and affirm for your students that your investment in them and your assessment of their worth is not based on their performance, but on their effort. Ferret out the difference for your students between striving for excellence and striving for perfection, and be conscious in deliberately modeling healthy behaviors and mindsets. Giving advice is not enough Finally, Johnson explained that a truly meaningful mentorship is a combination of psychosocial support and career support. Sponsorship is an essential part of aiding your students, and helping them to network is essential. He also noted some implicit gender biases that sometimes comes into play, and noted that women tend get too much mentoring, and not enough sponsorship. He encouraged mentors to coach their students for interviews and help them polish their vitas. He noted that great mentors will create a constellation of mentors for their mentees and refer them to others that they don’t know. Johnson ended by noting that when you do great mentoring, you’re creating mental maps for your mentees about what great relationships look like. You’re creating a roadmap for what professional mentoring relationships look like. By mentoring, you are creating a shift in your own culture, as your mentees will eventually go on to mentor others. You are doing more than you think. Johnson began by noting that mentoring often gets presented as a panacea. He noted that despite the fact that there is able research to support that undergraduates with mentors perform better both academically and professionally, and report feeling more confident, competent, more comfortable with their work-life balance, and achieve more imminent things in their professions, simply setting up an administrative “mentoring” program is not enough to achieve these results. Rather, Johnson emphasized that mentoring is a time-intensive activity, and only about 25% of undergraduate students reported that they felt as though they had a mentor – or even a professor who cared about them – during their entire college career. What is a mentor, and how do these relationships take off? Johnson prompted those at the tables around the room to discuss a scenario: Imagine two students come to your door and ask if you can be their mentor. How do you respond? How do you select the people to work with? Would you respond to these students in the same way? What is the best strategy for navigating this situation? The situation sparked a number of conversations as many participants realized that they did have preferences for the kind of students they prefer to mentor. Continuing, Johnson explained that different methods of matching students to mentors come with their own unique pros and cons. In an institution that has a formal program to match people with mentors (as opposed to having students find their mentors organically), more students tend to find a mentor. In these formal relationships, there are clear goals and endpoints for the relationship, defined boundaries, and informed consent between the parties. Allowing relationship to form naturally can lead to stronger partnerships and fonder feelings—however, sometimes at the cost of a clear definition of the relationship. He noted that in these kinds of relationships mentors may not even be aware that their mentees regard them as mentors until they hear about the impact they had on that student years after their graduation. On a similar note, Johnson also cautioned the room against labelling themselves as a “mentor” in these more natural relationships, and instead encouraged participants to wait for their students to assign them this title. After all, he noted, mentorship is a continuum. Many mentorships begin as more formal relationships—such as that of a research supervisor or an advisor—but as trust develops, a mentorship becomes more reciprocal. How can you become a mentor, and who should you mentor? Johnson noted that research indicates that spending time listening to your mentees is a top element of developing a successful relationship, and that carefully considering how you arrange your meetings is crucial to making students comfortable. For example, do you meet in your office, in a coffee shop, or in a bar? Do you meet at a time that is convenient for people with families, or in a place that alienates a certain type of student? He encourages faculty to consider the students that they already mentor, and ask themselves who might be missing. Do they mentor exclusively men? Exclusively people who mirror themselves? What makes for a truly meaningful mentorship? Johnson also spoke about other important elements of being a good mentor, such as encouraging mentees. He noted that imposter syndrome is prevalent among students, so telling your students that they belong and practicing affirmation in your comments is an important part of being a mentor. Especially when mentoring undergraduates, Johnson emphasized the importance of being conscious of these students’ ongoing developmental psychology and student development – recognizing and having sensitivity to the fact that they are in a stage of emerging adulthood. Rather than pressuring decisions, a good mentor unearths “the dream” – a vision of what an ideal world would look like. A good mentor practices the “Michelangelo phenomenon”—a term in psychology to describe how the best partners work with each other. How do you draw out the best in your partner? Mentors have to approach their mentees with the same humility and unassuming nature as Michelangelo took to the block – he was surprised when Moses or David would emerge, claiming that he didn’t always know what he was going to create. Ask your students Socratic questions in moments of crisis – asking them what they think a solution to a problem might be or what they would like to do, rather than telling them or handing them advice. Being unconditionally, non-judgmentally supportive and approaching relationships with humility and a learning disposition is essential, as is validating a student’s own style, rather than cloning oneself. Although mentors are not therapists, it’s also important to recognize that some students students come with unresolved issues – either rockstar students with a lack of confidence, perfectionist mentees with fears of failure, or students who approach the mentoring relationship as in some way reparative for another, more fraught relationship. Again, Johnson emphasized the importance of affirmation in these relationships. Be a champion for your students and affirm for your students that your investment in them and your assessment of their worth is not based on their performance, but on their effort. Ferret out the difference for your students between striving for excellence and striving for perfection, and be conscious in deliberately modeling healthy behaviors and mindsets. Finally, Johnson explained that a truly meaningful mentorship is a combination of psychosocial support and career support. Sponsorship is an essential part of aiding your students, and helping them to network is essential. He also noted some implicit gender biases that sometimes comes into play, and noted that women tend get too much mentoring, and not enough sponsorship. He encouraged mentors to coach their students for interviews and help them polish their vitas. He noted that great mentors will create a constellation of mentors for their mentees and refer them to others that they don’t know. Johnson ended by noting that when you do great mentoring, you’re creating mental maps for your mentees about what great relationships look like. You’re creating a roadmap for what professional mentoring relationships look like. By mentoring, you are creating a shift in your own culture, as your mentees will eventually go on to mentor others. You are doing more than you think. Posted January 10, 2018 by Sasha Patkin & filed under events. 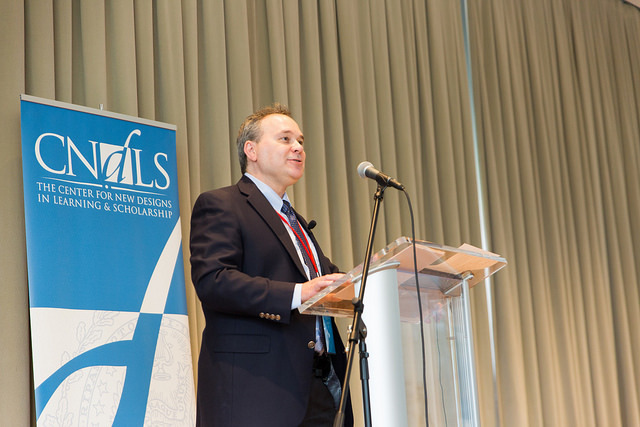 In an opinion piece published on Inside Higher Ed this week, CNDLS' David Ebenbach argues that academic institutions depend on the efforts of many people doing many kinds of work; faculty and staff, for starters, are both essential to our students' success. And yet at many colleges and universities there are few opportunities for faculty and staff to work together, despite the fact that we share an obvious point of connection: our students. Luckily, here at Georgetown, we have the Engelhard Project, which aims to infuse issues of student well-being throughout the curriculum. In this project, faculty bring topics of well-being into their courses, and staff from across campus—from CAPS, from the Academic Resource Center, from Health Education Services, and many more departments and centers at Georgetown—come to class to share their expertise on the topic. Great things happen in Engelhard courses: students make connections between what they're learning and their lives beyond the classroom, and faculty and staff make connections to one another. As they work together again and again and gather for informal Engelhard group conversations outside the classroom, these faculty-staff relationships deepen. Now about to enter its 13th year of existence, the Engelhard Project continues to reinforce the importance—and the responsibility—of a shared approach to our students' learning and well-being. Read the entire article here to learn more. In an opinion piece published on Inside Higher Ed this week, CNDLS’ David Ebenbach argues that academic institutions depend on the efforts of many people doing many kinds of work; faculty and staff, for starters, are both essential to our students’ success. And yet at many colleges and universities there are few opportunities for faculty and staff to work together, despite the fact that we share an obvious point of connection: our students. Luckily, here at Georgetown, we have the Engelhard Project, which aims to infuse issues of student well-being throughout the curriculum. In this project, faculty bring topics of well-being into their courses, and staff from across campus—from CAPS, from the Academic Resource Center, from Health Education Services, and many more departments and centers at Georgetown—come to class to share their expertise on the topic. Great things happen in Engelhard courses: students make connections between what they’re learning and their lives beyond the classroom, and faculty and staff make connections to one another. As they work together again and again and gather for informal Engelhard group conversations outside the classroom, these faculty-staff relationships deepen. Now about to enter its 13th year of existence, the Engelhard Project continues to reinforce the importance—and the responsibility—of a shared approach to our students’ learning and well-being. Read the entire article here to learn more. Posted December 15, 2017 by David Ebenbach & filed under announcement. It is hard to believe that 2017 is coming to a close. This year has been a promising one for the development of new technologies and initiatives in digital learning and scholarship in higher education. In the spirit of reflection, Inside Higher Ed asked a panel of experts questions regarding their thoughts on the most consequential developments in the field this year. Our very own Eddie Maloney, Executive Director of CNDLS, is featured in the article and shares his thoughts on the most exciting digital learning developments. Read the full article from Inside Higher Ed here. It is hard to believe that 2017 is coming to a close. This year has been a promising one for the development of new technologies and initiatives in digital learning and scholarship in higher education. In the spirit of reflection, Inside Higher Ed asked a panel of experts questions regarding their thoughts on the most consequential developments in the field this year. Our very own Eddie Maloney, Executive Director of CNDLS, is featured in the article and shares his thoughts on the most exciting digital learning developments. Read the full article from Inside Higher Ed here. Posted December 15, 2017 by Katherine Grygo & filed under Innovation. Hybrid courses are designed to use traditional face-to-face aspects and online activities in order to compliment a class’s learning objectives. What does it mean to teach a hybrid course? What are the best ways to integrate online resources into the classroom? In the 2017 TLISI “Think Hybrid: Conceptualize, Design, and Develop Your Hybrid Course” session, CNDLS staff, including Yianna Vovides, Kim Lubreski, and Zhuqing Ding, highlighted features of hybrid courses and ways for faculty to make their own courses “hybrid.” Hybrid courses are named for the structural elements of the course and how students are working rather than the way in which they are learning. Vovides explained that for a class to be considered a hybrid course at Georgetown, 30-70% of classroom time is spent outside of the traditional learning environment. Ways this time could be spent include online meetings via Zoom or a class trip. The subject of the course, whether it be humanities based or science based, will impact the methods. Faculty broke into small groups to discuss advantages and disadvantages of hybrid classrooms and the benefits of a hybrid course. Most groups came to the consensus that some of the biggest challenges facing hybrid courses is developing high quality content and finding time to create genuine connections between the in-class and online parts of the course. 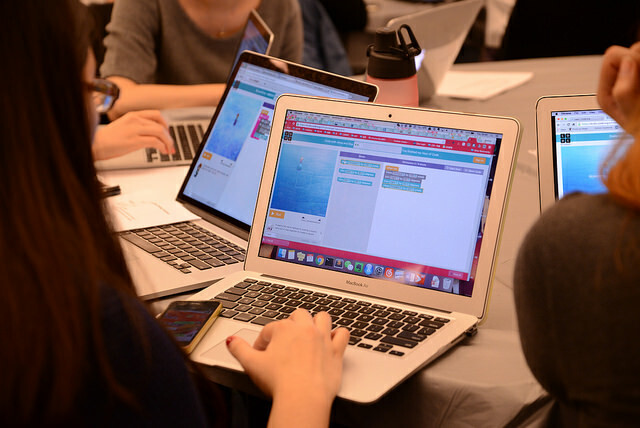 All groups concluded that hybrid courses allow for students to spend more time actively learning course content and seeing how the information is applicable outside the scope of the classroom. This in turn can give students the opportunity to interact with the material on a deeper level rather than what they may have gained from solely studying it. One of the attendees brought up that there is a difference between science and humanities courses that is addressed by the hybrid class structure. Humanities, for the most part, have always had work that they could do outside of class. For language students, it is necessary to immerse themselves in the language and engage with it as often as possible. Literature students aren’t going to spend class time reading but rather in a discussion of what they have read beforehand. On the contrary, science students haven’t had those same opportunities as homework consisted of reading from a textbook or doing problem sets. The hands-on learning has been lacking. With hybrid courses, there are more possibilities for active learning outside of the classroom for students of all disciplines. Hybrid courses are named for the structural elements of the course and how students are working rather than the way in which they are learning. Vovides explained that for a class to be considered a hybrid course at Georgetown, 30-70% of classroom time is spent outside of the traditional learning environment. Ways this time could be spent include online meetings via Zoom or a class trip. The subject of the course, whether it be humanities based or science based, will impact the methods. Faculty broke into small groups to discuss advantages and disadvantages of hybrid classrooms and the benefits of a hybrid course. Most groups came to the consensus that some of the biggest challenges facing hybrid courses is developing high quality content and finding time to create genuine connections between the in-class and online parts of the course. All groups concluded that hybrid courses allow for students to spend more time actively learning course content and seeing how the information is applicable outside the scope of the classroom. This in turn can give students the opportunity to interact with the material on a deeper level rather than what they may have gained from solely studying it. One of the attendees brought up that there is a difference between science and humanities courses that is addressed by the hybrid class structure. Humanities, for the most part, have always had work that they could do outside of class. For language students, it is necessary to immerse themselves in the language and engage with it as often as possible. Literature students aren’t going to spend class time reading but rather in a discussion of what they have read beforehand. On the contrary, science students haven’t had those same opportunities as homework consisted of reading from a textbook or doing problem sets. The hands-on learning has been lacking. With hybrid courses, there are more possibilities for active learning outside of the classroom for students of all disciplines. Posted December 8, 2017 by Sam Whalen & filed under TLISI. For many faculty, recording class lectures may seem like a challenging and daunting process. 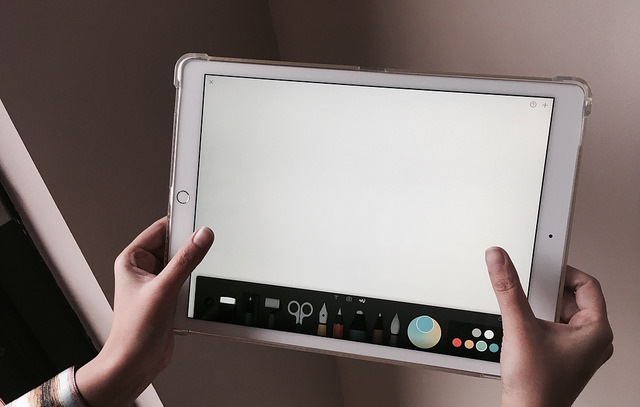 Thanks to the latest Apple operating system update, instructors are now able to capture screen recordings directly from their iPhone or iPad devices making it easier to record lectures and integrate them into traditional face-to-face courses, a hybrid or flipped course, or an online course. Read the full blog post to learn more about how this feature adds both mobility and versatility to teaching. For many faculty, recording class lectures may seem like a challenging and daunting process. Thanks to the latest Apple operating system update, instructors are now able to capture screen recordings directly from their iPhone or iPad devices making it easier to record lectures and integrate them into traditional face-to-face courses, a hybrid or flipped course, or an online course. Read the full blog post to learn more about how this feature adds both mobility and versatility to teaching. Posted December 7, 2017 by Katherine Grygo & filed under Innovation.